An all-natural, proprietary weight loss formula. 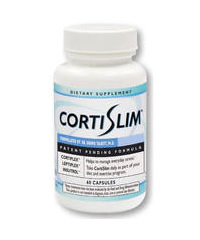 CortiSlim is an all-natural dietary supplement that works with your body's metabolism to control cortisol levels within a healthy range and help you lose weight. By modulating cortisol levels, CortiSlim reduces one of the primary physiological signals for weight gain. CortiSlim reduces your stress and weight! Because CortiSlim helps to reduce stress at the same time it helps promote weight loss, users often notice rapid improvement in their feelings of stress. Typically, this means that within an hour after taking CortiSlim, its unique ingredient blend begins working to reduce your stress, and increase your feelings of mental focus, energy, and being in control.